As in many low-income countries, the treatment gap for developmental disorders in rural Pakistan is near 100%. Many barriers to care exist for children with developmental delays, and conventional health services research has been unable to overcome diverse bottlenecks (e.g. lack of mental health professionals, chronic shortage of funds, weak health and social care systems, stigma attached to mental disorders, and a lack of political will). The innovation aims to reduce the burden of intellectual and developmental delays in children while empowering, organizing and training their families. We adapted the WHO mhGAP-IG1 developmental disorders module and Parent-Skills Training (PST) program to manage children with developmental delays in community settings through non-specialists. The goal is to make this package available at-scale to populations that have neither the means nor the expertise to deliver it. 1) Social innovation (Family Networks): to establish networks of families with children with developmental delays within the community. 2) Technological innovations (Interactive Voice Response (IVR) for screening, Avatar Assisted Cascade Training (ACT), Mobile Information Management System (MIMS)): to standardize the intervention material and to use for the training and supervision of non-specialists. 3) Business innovation (Social franchise model): to make the model scalable and sustainable for the larger population. c) Increased family empowerment resulting in increased awareness and reduced stigma about the condition. The Family Networks will be empowered to advocate for better rights for these children (lobbying with public health and social care agencies for more opportunities to participate in education for the children and to provide better care). The program includes a detailed economic evaluation including cost effectiveness analysis to inform scale-up and policy. The WHO Mental Health Gap Action Program Intervention Guide (mhGAP-IG)1 for developmental disorders and Parent-Skills Training (PST) program for children with developmental delays was adapted to a technology platform—to ensure fidelity of intervention programme—for delivery by non-specialists in community settings. 1) Social innovation: organise an active, empowered group of family volunteers (champions) within the community who could be trained to provide WHO mhGAP interventions to their own children, and to cascade them down to other families in their villages. An integrated assessment tool based on standardized WHO measurements (WHODAS Child) to monitor outcomes of the children and families and to provide ongoing supervision. 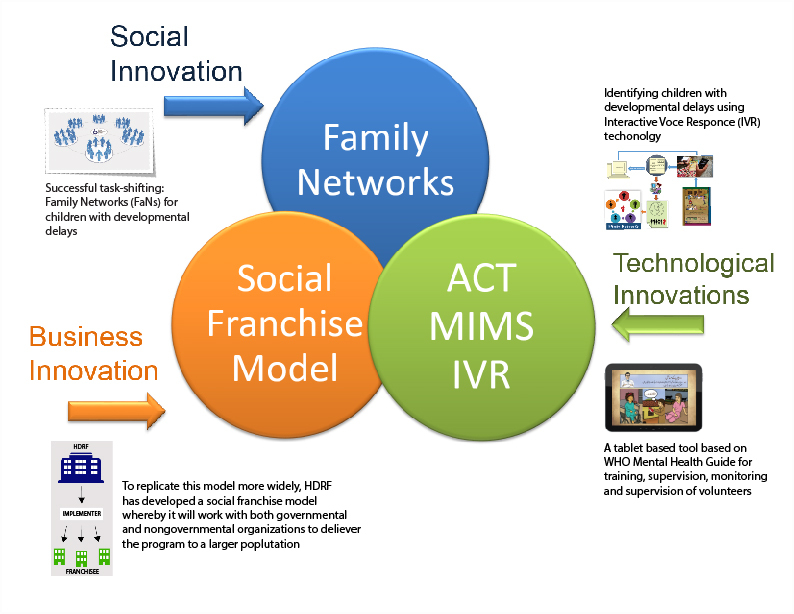 3) Business innovation: social franchise model for rapid replication and scale-up. For additional details on the innovation, refer to the research paper attached under Resources - "Model for service delivery for developmental disorders in low-income countries." The innovative model of service delivery for developmental delays has been recognized for its potential to address implementation bottlenecks in low income settings and has been awarded a transition to scale grant by Grand Challenges Canada. The match fund has been provided by Autism Speaks, USA and Human Development Research Foundation, Pakistan, to serve a population of one million in a rural sub-district of Pakistan. The tech-assisted screening, assessment, training and supervision tool developed through Family Networks program is being applied in scaling up management of perinatal depression through the Thinking Healthy Program in Pakistan. The field of mental health in low-income countries suffers from implementation bottlenecks, and the political will to invest in this area remains low despite the exponential increase in need. Innovative solutions from the social, technological, and business domains as illustrated in this program will need to be incorporated into the framework of implementation research to make scale-up of such mental health interventions a real possibility. Effectiveness of the Family Networks program will be evaluated through a cluster randomized control trial in a sub district (30 Union Councils – a Union Council is the smallest administrative unit in Pakistan) with a population of approximately 1 million. Outcomes will be assessed at 6 months after the implementation of the program. Outcomes include WHO Disability Assessment Schedule for children (WHODAS-Child); Secondary outcomes include socio-emotional well-being of children, stigma and parental distress, quality of life, empowerment and utilization of health care services by the families. A qualitative process evaluation will be conducted to evaluate the program delivery. Cost effectiveness evaluation will be carried out at the end of the program as a part of economic evaluation. The program includes a detailed economic evaluation including cost effectiveness analysis to inform scale-up and policy. Population of 1 million will be screened for children with developmental delays using IVR and a house-to-house survey with the help of lady health workers. 500 champion family volunteers will be trained to provide this evidence-based intervention to their own children and to cascade it down to other families in their community. 3000 children and their families will receive the program. World Health Organization. Mental Health Gap Action Program (mhGAP) intervention guide for mental, neurological and substance use disorders in non-specialized health settings. 2010. Available at: http://whqlibdoc.who.int/publications/2010/9789241548069_eng.pdf. Grand Challenges Canada. Integrated innovation. 2010. Available at: www.grandchallenges.ca/wp-content/uploads/integratedinnovation_EN.pdf.